A hot, Midwestern sun beat down on the Sunday airport crowd strung along a makeshift rope barrier. As one. 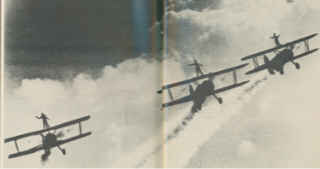 all eyes were zeroed on three approaching Stearmans, gaudy in glistening colors, flying wing-to-wing above the runway. On they came, the white-clad wing-riders with arms stretched birdlike, their raucous 'blat' of 450 Pratt and Whitneys outracing the planes. As if on signal, silver smoke spewed from each machine moments before the formation arched up in precision flying. With quickened pulses and necks craned, the crowd stared open-mouthed as the planes, invisibly linked, climbed upward and eased over in perfect loops. Leaving graceful patterns of smoke, the trio screamed down to level out before the electrified spectators. A collective sigh rippled through the crowd. A freckled boy, bubbling with excitement could scarcely contain himself. "Wow!" he shouted above the din of the snarling engines, and a happy grin spread across his face. In his own way he was expressing the sentiments of the crowd. The scene featured this Sunday afternoon is a glimpse of a Cole Brothers Act that was duplicated hundreds of times following World War II. For 17 years the name Cole Brothers echoed across America, until it became, if not a household word, at least knowledge at every American airport. Strangely, the Cole Brothers name has endured, while other aerobatic teams of same years remain largely unknown. To unfold the story of the flying family we lift the curtain of time. The brothers, Duane, Lester, and Marion, were products of the depression years. 1931 was the blackest year of all; in the Midwest thousand of farmers were forced from their lands due to closing of banks in every community. It happened at Toulon,Illinois, as elsewhere and the Cole Family sadly lost their 200 acre farm. Another farmer, more fortunate, permitted the large family to move into an undersized tenant house. It was a deplorable setup, and to make life more unbearable there was no work, especially when corn cropped from one dollar a gushed to as low as nine cents. The hand in mouth existence prompted the older boys, including Duane, to do as millions disheartened boys were doing - leave home. Some rode freights;other hitchhiked. Duane hitchhiked. For a year or more he knew adversity. By the grace of God he found a small job here, another there, and despite hunger pains at times, pride kept him off bread lines. Never once did he lose his self respect. It was Christmas day that fledging wings were sprouted. As Duane walked the streets of Phoenix, Arizona, his cheerless thoughts turned to other Christmas' when the family was together, gathered around a lighted tree, opening presents - it was like looking back on another world, a happy world, indeed. Aimlessly he walked in an effort to shake depressed spirits. At length, his steps brought him to Phoenix Airport, as steps in the past had brought him other airports. Previously he had found solace at airport, listening to an engine warm up, soaring in thoughts as the plane took off, but never had dared precious dollars for a hop. Call it fate; call it what you will, but on impulse Duane asked the pilot of the Velie Monocoupe, "How much for a flying lesson?" "five dollars is the regular price." In an undramatic gesture Duane took out his billfold, opened it, and removed a lone dollar bill. From his pocket he fished fifty cents. "It's all I got," he said, in his mind he pictured eating money for a week, providing he bought stale bread and invested a nickel for a can opener. The pilot looked closely at the boy who needed a haircut, wore rundown shoes. Perhaps he saw something besides telltale tolls of the bog road. Perhaps he saw, or thought he saw, deepseated determination to fly. Perhaps there was Christmas Charity in his heart, and perhaps a buck and a half was needed to feed his wife and kids. Whatever it was, or combination thereof, the pilot said,"Hop in," and gave Duane his first flying lesson. By the mid-thirties Duane hitchhiked home with a scattered three hours of flying time, but it was enough to solo, he presumed, and accordingly proved the assumption in a Piper Cub at Peoria airport. The country was slowly crawling out of the depression; there were signs of recovery if you looked closely. A factory in Peoria began hiring. The family moved to the city and Lester dropped out of school to take on a man-sized work although he was only 16 years old. The family began eating regularly. Duane too took a factory job; when there was ample bread to keep the family, Duane seriously began thinking of his future, or more precisely, his flying future. He reasoned with the purchase of a club plane, he could build up essential flying time at little cost. His enthusiasm infected Lester, who promptly sold a pig he had raised in he back yard, and thus pooling their money they made a marginal payment on a 37-hp Taylorcraft. To meet payments and gain flying experience the decided to become weekend barnstormers. "Barnstormer," snorted an old timer at Peoria airport. "Listen. bubs, barnstorming went out with flag pole sitting and Mah Jong. In the first place airplanes aren't a novelty anymore , and in the second place, people ain't got no money for ride." By 1940 was clouds were on the horizon, and most everyone sensed it Duane took over management of the Streeto Airport, and instructed mornings in a college flight program at Waterman. Sixteen-year-old Marion, baby of the family, joined Duane as hanger boy. And then came an incident legends are built on. Duane, driving back earlier than expected, was utterly amazed to see his J3 cub in the air. It could only mean one thing. Marion was flying. Incredible as it seems, Marion was flying without a minute instruction. Seems he wanted to impress the farmer girl across the road. He did, and Duane too, who promptly saw to it the kid brother had proper stick time. President Roosevelt, fearful of approaching war, inaugurated a program to vastly expand the Army Air Corps. To implement the program civilian pilots who kept aviation alive during the depression where recruited as instructor. Duane and Lester with their wives and Duane's baby son, Rolly, journeyed to California gave their war contribution at War Eagle Field, Lancaster. Marion instructed in the Navy Flight Program at Bloomington, Ill, but before doing so he surreptitiously taught flying a at a Midwestern airport. And thereby hangs the tale. When the war effort drained off Commercial pilots there just weren't enough qualified pilots to meet instructional demands prompted by return flush times. The airport operators who struggled valiantly through the depression found their operations in jeopardy for the lack of personnel; they met the war emergency in their own ways, unofficially, of course, Marion's tender age of 17 prohibited a required a rating, never-the-less he had the knowledge and the ability recognized by a desperate operator, who made use of his talent. When Marion's birthday rolled around he successfully passed his commercial test, and then immediately offered his service to the Navy. The officer that processed his papers was duly impressed, for stuck out his and and said "Let me shake the hand of the youngest instructor in the United States Navy." As we know, the air might of the armed forces broke the back of Germany, and shortly thereafter played the knockout roll in conquering Japan. Suddenly, there were no more wars; It was a glorious feeling. The country went wild. About yea million GIs were free to make dreams come true. Duane, Lester, and Marion were not without dreams; theirs would be a joint airport operation. they leased a hay field boarding the town of Kewanne, Ill, and to publicize their venture, made July 28, 1946 and "open house" day with aerobatic performances by the brothers. A special attraction was to be " Colonel Jet Jet and his fight wingman." Jet and wingman were advertised for a 4p.m. arrival. As the hour approached a plane appeared - not a fighter, or formation of fighters, but rather a Piper Cub. Curiously, the crowd watched as the Cub circled the field. The door opened and out flew three Guinea hens to spiral down into neighboring barnyards. there were grumbling over false advertising, but the crowd's humor returned when Duane hastily staged a "pants race" - the contest were to fly six miles around a course, land, take off their pants in front of the onlookers, and jump back into their planes to finish the race. But on the second landing, the pilots found their pants tied in knots and tossed in a pile. It was a conclusion that sent everyone home in good humor. 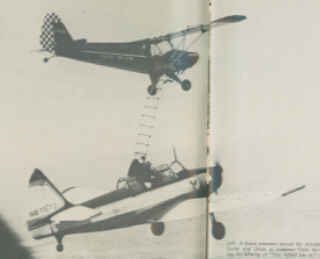 From this small beginning evolved the Cole Brothers Airshow, a full-fledged traveling troupe with three Stearman, a great lakes, and a clip-wing cub. 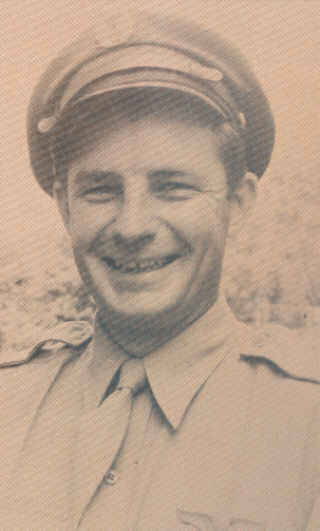 The additional pilots, parachutist and wing-riders were young friends. Arnold, another brother, joined the show as announcer. These early tears were fun for the brother; principally because of the appreciation foe the airplane's spectacular role in the war. The plaudits of overwhelming crowd were heady tonics. Moreover the cash register had a happy ring. 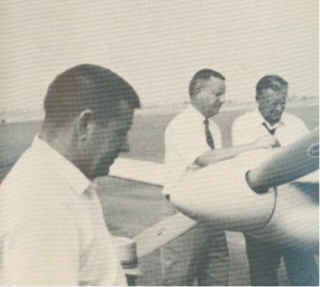 Marion was the star performer, especially after he won the Nation Aerobatic Championship in Miami. Not until the 1950's did the glorious ear begin to fade. With each passing year, World War II was becoming more and more history and less and less reality. When attention shifted to rockets and guided missiles, the airshow business suffered accordingly. Duane met the situation by Streamlining his troupe, eliminating additional pilots and planes, and unusually one wing rider instead of three. 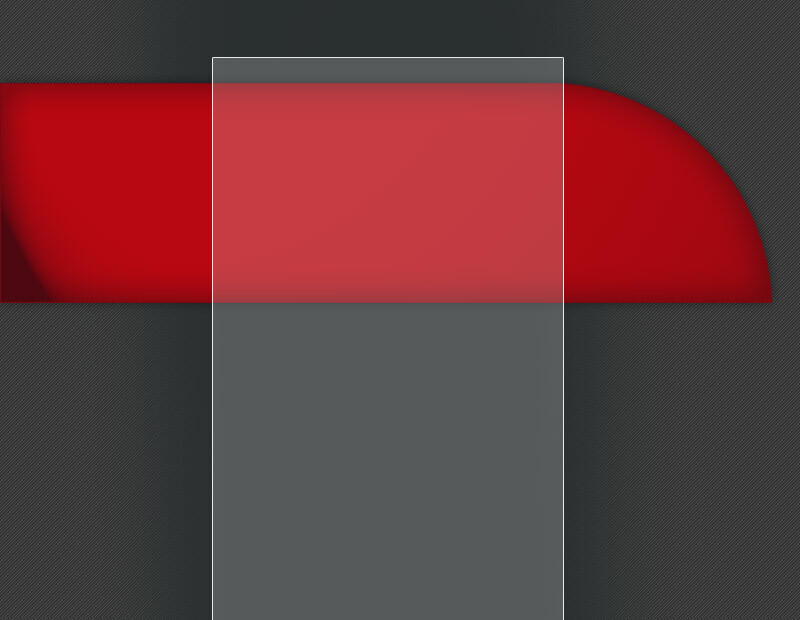 The adjustment was marginal, enough to stave off a possible end. Many airshows folded; those remaining provided cutthroat competition. Pickup groups flew for peanuts. What hurt most were the several fast buck promoters. These fugitives from street carnivals had never been upside down in a plane, but they promoted shows by loudly proclaiming phony championship records for their flyers. To make matters worse, they never quite lived up their agreements, and too often conned the sponsor out of the gate receipts. In short, they gave airshows an odious smell. Another serious matter was that airshows were without5 proper policing; consequently irresponsible practices were unchecked by "hot Pilots" emulating Hollywood stunts of the 1920's. Never once would Duane permit "stunting" to be a part of his performances; always it was precision aerobatics. What he feared most from the competition came to past at Flagler, Colorado. there a pilot bored headlong into the crowd. President Truman reacted the senseless deaths. Airshows were banned. Duane flew to Chicago. The ban is harsh and unreasonable,' he argued with CAA officials. As no decision could be reached in the regional office, he put in a call to Washington. "I'm willing to lift the ban, providing adequate policies and regulations are formulated," administrator Fred Lee told Duane. "Say, by the way," Lee added, "why don't you get in a huddle with Bill Wagner (regional manager) and work out something." Three days later; the regional office turned in a draft that was largely the work of Duane. He had merely put down the safety practices he had rigidly lived by. Perhaps its not surprising the draft was adopted on toto. Airshows were back in business with sane restrictions. However, the Flagler tragedy and the ban had dampening affect on public and sponsors alike. Bookings were canceled; gate receipts fell off. The Cole brothers struggled against these odds until they eventually they touched bottom in Humbolt, Nebraska. After meeting all expenses there was exactly; $28 left to divide between them. Sadly, the brothers discussed their plight. "We got to split up," was the verdict. "A smaller show, accepting only guaranteed bookings will make it O.K," declared Lester. When it was decided Duane would continue the show, he asked, "What will you fellows do?" "That French contract looks pretty good; maybe I'll accept," replied Marion. In previous weeks the French government had offered him a contract to fly in France to promote sport aviation. "With my instructor's rating, I'll get by," said Lester. The phaseout period actually extended over months, but in the end, Arnold left to sell cars, Lester took an instructors job in Riverside California, but in 1957-58 again flew with Duane. When Jack Fry heard that Marion would be foot-loose he offered him a test-pilot job on revolutionary plane under development at Fort Worth. Marion remembers it as a "Hairy-go" to fly. Time passed and the airshow survived, partly because of Duane's sharp business sense, and because working in Duane's favor was a solid reputation for ethics and reliability. Previous sponsors asked for return bookings. Duane retained the name the Cole Brothers; across the land the name was being mentioned more and more. Hollywood learned about the Cole Brothers, and the four brothers united in California on several occasions to make TV pictures. Several studios showed an interest in doing a movie-length Cole Brothers story; there were interviews, however nothing developed. Ever since the days of Lincoln Beachy, airshows have come and gone, with an average longevity of a couple of seasons. For 17 years the Cole Brothers Airshow dominated the American scene. In the final years it was a Duane Cole family affair. 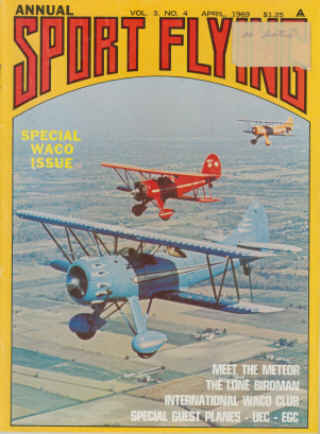 The lineup was Duane and son, Rolly, doing precision aerobatics; wife, Judy, riding the wing, John - too young to fly handled the announcer's mike; while little Karen made herself an indispensable chore boy. The parachutist was a young friend of Rolly's. It was a close-knit family, a happy family, and the future appeared bright and rosy. The long years of perseverance were paying off. Duane could now pick and choose his bookings. He changed his base to Fort Wayne, Indiana. Among the aerobatic fraternity the word was, "Keep you eye on Rolly; he's going to be the greatest." In his teenage years he was developing an uncommon touch that made his aerobatics pure artistry to watch. Although Rolly's star was ascending, he still wasn't as good as dad, as demonstrated at the Phoenix in National Championship competition. Duane, the old master, copped first place, Rod Jocelyn second and Rolly third. When Duane journeyed to Budapest, Hungary, in 1963 as a member of the U.S. Aerobatic team, Rolly was unavailable because of National Air Guard commitment. On August 2, 1964, the world of the Cole Brothers Airshow came crashing down, literally in an Illinois cornfield. 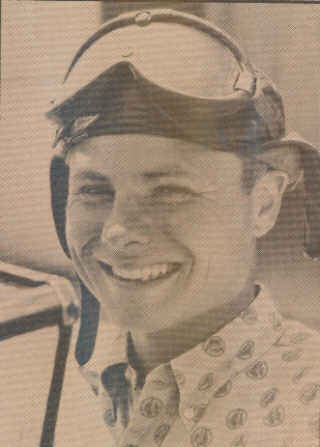 Rolly, practicing in his Stearman for a forthcoming international competition in Spain, had Mel Stickney, airline and race pilot, as passenger in the front cockpit. All evidence points to an instantaneous breakup in the engine that caused great vibration. 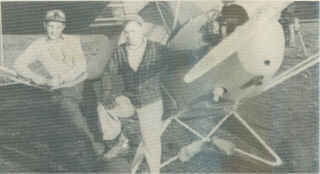 Mel Stickney was trapped when a wing folded back. Although there was altitude for Rolly to jump, the evidence again is he delayed to rescue Stickney. When Rolly jumped, it was to late. Both died. With him died the Cole Brothers Airshow, for Duane was too grief stricken to continue. "Now there are no contracts to be signed or publicity material to be mailed, no hurrying from town to town and no cloths to be packed, no more sleeping in motels or hotdogs and soda pop for Sunday diner, no new scenery to marvel at or strange and fascinating cities to savor. We will accustom ourselves to living as other do. We will wash the car or clean the garage on Saturday and go visiting Sunday night. We will have roast beef for dinner with mashed potatoes with gravy after church and sit home watching television on Sunday afternoons and evenings. Our habits will change and possibly our personalities. But as we look to this quiet future, we will forever thankful for an exciting past." More than four years have passed since that tragic Illinois afternoon, and while the Cole Brothers Airshow was never revived, its name still has a popular ring. Duane, in his mid- fifties, has added more Laurels. Aside from being the author of three successful books, he again captured a nation Aerobatic Championship at the Reno meet. Today, he divides his time between writing and teaching aerobatics. Both Lester and Marion are executive pilots. In 1967, Marion attempted a comeback. After a long aerobatic layoff, he placed first at Rockford, and in 1968 won the General Claire Chennault trophy for outstanding precision flying; he also journeyed to east Germany with U.S. aerobatic team. In the year 2001 it is predictable that world will be so space conscious that all interest will turn from cowboy and Indian heros to those colorful personalities who advanced the stepping stones of aviation to the space age. Thus it is conceivable the future TV heros will be portrayal of the Cole Brothers like, if not the legendary Cole Brothers themselves. The 'last of the barnstormers' may live on. 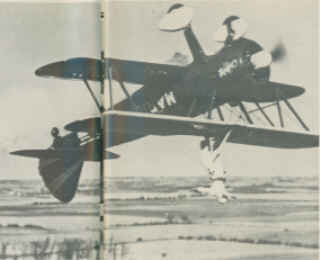 Marion Cole Flying a wing-rider. Filming "You asked for it,"
Arnold, Lester and Dean, a nephew. L to R; Marion, Lester, and Duane Cole. 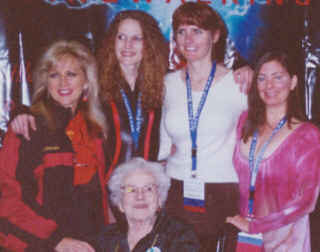 Teresa Stokes, Carol Pilon, Jenny Forsythe, and Margaret Stivers at an ICAS convention six months before Judy Cole's death.